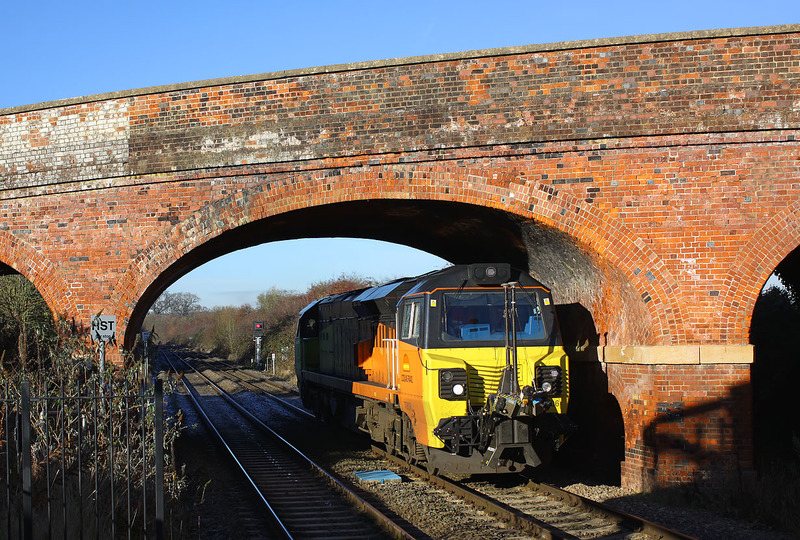 70806 passes underneath the roadbridge on the approach to Charlbury station on 30 November 2016 with the 0C08 07:22 Westbury to Westbury (via Worcester Shrub Hill) Fugro Raildata track survey working. The Rail Infrastructure Alignment Acquisition System can be seen mounted on the front of the locomotive. This was booked to wait in Charlbury station for 15 minutes, but it arrived 10 minutes early, and the DMU coming the other way was slightly late, so the wait was more like 25 minutes. Note the white painted patch on the bridge. This was a sighting aid for the former semaphore signals (removed in 1971).